Some SQL Server 2005 / 2008 performance considerations. Type of doc	: It's just a few notes on SQL Server performance in simple words. It's no more than just "entry level". For who : For anyone who likes a short orientation on the subject. But for experienced DBA's, it's too simple. Chapter 1. How to "quickly" determine if you have Disk I/O problems. Chapter 2. Some remarks on Virtual Machines and a large, active, SQL Server environment. Chapter 3. Some remarks about a 64 bit OS and 64 bit SQL Server edition. Chapter 4. Indexes and Index tuning. Chapter 5. How to determine if you have a CPU problem . - 5.1 Using "System Monitor"/"Performance Monitor"
Chapter 6. Allocation Unit and Partition Alignment. Chapter 7. Placement of objects on Filegroups. This is a short note, introducing some basic considerations on SQL Server performance. If you are an experienced SQL Server DBA, this note is probably not for you (but you are certainly invited to read on!). stuff on performance, then you are at the right place. But.., remember, this note is surely no more than a lightweight discussion. And a very important remark should be made right at the start: we are not going to discuss "Query Design and Tuning"
there are "smart" choiches on the datatypes, considerations if you need partitioning etc.. etc..
is "Query Design & Tuning". Now, this note will not address that subject. What is meant by Query Design and Tuning ? Ultimately, Users or applications, send SQL Statements to the database engine. 20 or so nested joins of possibly a mix of small tables, large tables, and possibly very large tables. while others are difficult and lengthy. The same is true for how someone designs a query and how it will be executed. that the database Server just whished someone pressed the shutdown button. So, query design and tuning, is extremely important ! Yet, we don't mentioned it in this note. Ofcourse, one element in Query Tuning will be addressed, and that is determining the best use of indexes. But, the subject on how to best actually write Queries, is not. And believe me, it is a very important subject. If some application uses horribly bad designed SQL Statements, it's really very hard to fight that. Note: you might not even be in control on Query Design at all. Suppose you use a "third-party" application (which is very likely). a 'tracing tool' (the profiler), or by using some smart queries on the Dynamic Management views and functions. Then, in principle, you can hold the results to those developers, along with recommendations. But, yes, that might be a bit of an "optimistic" view on matters. Could this note then has something to say at all? Definitely! There are so many considerations on SQL Server peformance. memory, the network subsystem, and all relevant specific SQL server counters. That is true. But it does not mean that you can't focus for a while on just one particular subsystem only. If we do that, the only thing we should beware of, is that we should not jump to conclusions right away. Ok, that's fair enough. Still, the following gives us very important clues on the status/statistics of Disk IO. A few "dynamic management views and functions" in SQL Server, can show you quickly whether Disk IO is good or bad, or something in between. or, indeed the disksubsystem cannot keep up with the demands. Also, a number of counters of "System Monitor" (or Performance Monitor) in NT, will show you quickly the same thing. which you can start from "SQL Server Management Studio". The function takes two parameters. If you leave them as "null", you will see IO statistics on all files from all databases. That ofcourse, could already be good enough. Below, you see an example of the output. Before we discuss this very interresting output, here is some more info on the function itself. If you want to use parameters (for a shorter list), then you should know that the first parameter is the "database id" (dbid), and the second one is the "file id" (fileId). This way, you can "focus in" to a particular database and/or particular file. Now let's turn our attention to the output. As you can see, you find a number of very interesting columns in the resultset. BytesRead: Number of bytes read issued on the file. BytesWritten: Number of bytes written made on the file. IoStallReadMS: Total amount of time, in milliseconds, that users waited for the read I/Os to complete on the file. IoStallWriteMS: Total time, in milliseconds, that users waited for the write I/Os to complete on the file. The last two values, thus represent the "stalls" on reads and writes. Obviously, they should take on small values. If you see high values, It does not automatically means that you have a "bad" Disksubsystem design. Ofcourse, that could be true, but also other configurations can contribute to the effect. and thus a lot of contention takes place, which can result in the "stalls" observed. So, the output of the "fn_virtualfilestats" function, cannot lead to exact conclusions right away. You can identify files which are "hotspots", thus which have a large number of reads and/or writes. This could mean that you must move a (few) "active" table(s) or index(es) to a new file on another disk. to a new file on another disk. then, it might be a clue that Disk IO is not optimally setup. But, we do not jump to conclusions yet! You see? We already have learned a lot. But we need more information, so let's see what the next section brings us. 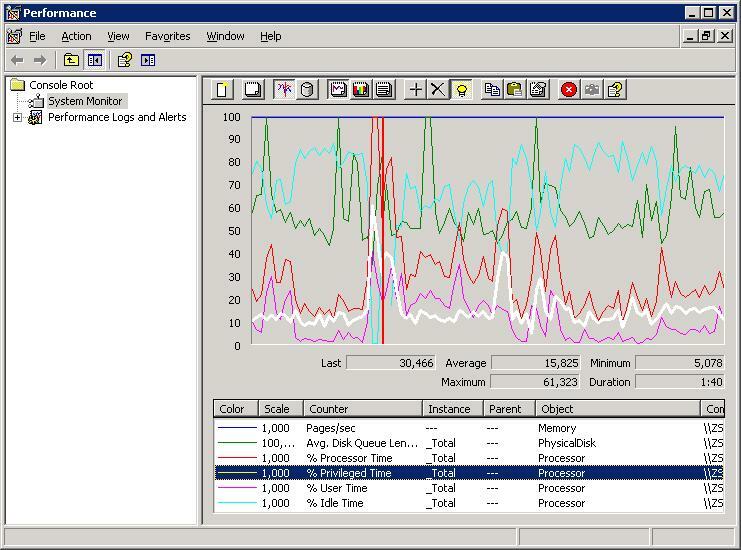 System Monitor (or Performance Monitor as many people still call it), is a well-know NT performance measurement utility. You can do "real-time" measurements (viewing real-time graphs), or you can log the findings to a file. If you want to start it, just open a command window and enter the perfmoncommand. - a "counter", of an object, is a measurable metric that is exposed by that object. An object usually has many counters. This chapter deals with the subject on how you can discover Disk I/O problems, so we will focus our attention to that subject. If you want to add counters, just navigate to the "graph" section and right-click. Then you will see a menu to add counters. There objects (each with many counters) which describe your system and OS, like processor, memory etc..
And, if your Server has SQL Server installed, there are many objects from SQL Server as well. First let's take a look at the standard system counters, related to the Disk subsystem. Note: maybe you want to check with your sysadmin whether disk counters are "activated" (it's very likely that it is). As objects, you can choose "PhysicalDisk" and "LogicalDisk". Logical Disks are structures like "partitions", like an E: drive. it should contain databasefile(s), or the transactionlog file(s). So, for example you might choose "G:", because this "disk" contains an active Index file. Or, you might choose the "_Total" object of the LogicalDisk object, which means you measure all disks at the same time. And if you have a dedicated SQL Server machine, then that's not a bad choiche. In the figure on the left, you see a very "exaggerated" example of a perfmon graph. Note the various counters diplayed. The "yellow" line is "%Disk Time", while the "green" line represents the "Avg. Disk Queue Length". The values shown here, are a bit high. Who cares, it's just an example. The "PhysicalDisk: % Disk Time" counter monitors the percentage of time that the disk is busy with read/write activity. If the "PhysicalDisk: % Disk Time" counter is constantly high, (more than 80,90 percent), we might see a problem. for disk access. If you see that taking values like 2, 5, 3, 4, 10, 1 etc.., there is likely no Disk IO problem. If you want to see that expressed in a rule: the number of oustanding request should be no more than 2 x (the number of spindles). So, suppose you see constantly high values like 20, 30 or higher, you might agree we probably have a serious Disk IO problem. Also note from the above figure, that I took the counters of the "PhysicalDisk" object, over all "disk instances" (shown as "_Total"). As always, however compelling the "evidence" seems to be, never jump to conclusions right away. We still need more information. Now, what about the specific SQL Server counters? Sure, and we will see them in Chapter 6! Since version 2005, SQL Server has a very extended dictionary with "system views" and "system functions", for use for the DBA. The views contains a wealth of statistics on sessions, locks, transactions, system metrics like latches, Disk statistics etc.. etc..
At last, we have reached the level of Oracle DBA's, which for many many years queried their hundreds of v$ and DBA_ views. dealing on Disk IO, so one Dynamic Management view stands out: "sys.dm_os_wait_stats". This view is specifically for gathering "waits" on a large number of events. But we must remember that the values in "sys.dm_os_wait_stats", are "cumulative", that is, information is added all the time. The counters can be reset using the SQL statement DBCC SQLPERF ('sys.dm_os_wait_stats', CLEAR). You could already use "select * from sys.dm_os_wait_stats", but that query gives use too much (unfocused) information. In the figure on the left, you see a better query variant on sys.dm_os_wait_stat. We specifically leave out fields which we are not interrested in (at the moment) because we want to focus on events related to Disk IO. That's why we use the clause "where waittype not in (..)". And, we use the clause "top 10 *" because we are interrested in the "top 10 IO metrics". Note: below you will find the query in clear text). Also note that you can write nummerous interresting query variants on sys.dm_os_wait_stats. Let's now focus on the output of this specific query. In this specific example, the query was run on a system which has quite a Disk IO problem. A very important column to pay attention to is "wait_time_ms", which shows us the time in ms, which processes had to wait for, for that specific "wait_type" (shown in the first column). "Pageiolatch_sh means that a session is waiting for some page to be brought into memory, from database files on disk. That a small wait is involved is understandable. However, if the Pageiolatch_% waittimes are too high, it could be an indicator of a Disk IO problem. IO problems can also be be a considerable factor, if ASYNC_IO_COMPLETION and IO_COMPLETION show high wait times. The values are cumulative ofcourse, and you might consider the above DBCC command, to start over. What are reasonable values of the Pageiolatch_% values? The query that is shown in the figure, actually tells you. If it's listed high in the top 10, we have an indicator of a Disk IO problem. So, we did what was promised in the title of this chapter: How to "quickly" determine if you have Disk I/O problems. or that indeed the disksubsystem is not good enough for the SQL Server environment. scaled properly. There are just so many competing sessions, that everything "overloads". Ofcourse we can investigate that too. It's just a remark "to be carefull" with conclusions. In case of a very large, very "active" database, better not virtualize your SQL environment. Well, that's my opinion. In today's Datacentres, many physical Servers are present, where each physical machine is running many "Virtual Machines (VM)". Almost always, some "virtualization" product is used by which the Admin is able to create VM's on that Host. Those VM's, each get their share of memory, virtual cpu's, network access, and disk access. It does not have to be a problem. But fact is, that many physical Hosts gets "crowded" with competing VM's for resources. This is the way many "businesses" work: new projects get alive, which all need their own test- development- and production machines. In many cases, it's hard for a sysadmin to keep all the demands and resources in balance. of the specifics of storage. This is not the way that you will have fun with large, and/or active, databases. Otherwise you might encounter very serious Disk IO problems. Don't get me wrong: for smaller SQL Server database, you probably will not have any difficulties at all. And besides, ESX has all sorts of very neat tricks, like online moving a VM to another host, and much more. But for a very large, very active database, take care. You might consider a dedicated physical machine. By the way, the general consensus "in the IT community" just seem to support the above view. (please note the word "seem" here). Anyway, at occasions that I talk with Microsoft engineers on this subject, they always say that it's indeed "Not Done". on VMWare. I always seem to have problems with Windows Virtualization and large databases. For me, it does not work well. where Disk IO is a prominently number "1" cause of low performance. So, it's certainly not an "absolute truth". I only tell you to be carefull, and try to create good test scenario's. and storage admin, and make your resource requirements very clear (and make them your friends as well). Chapter 3. In case of a large, very "active" database, always choose a 64 bit OS and 64 bit SQL Server edition. SQL Server can use, compared to a 32 bit edition, the difference is astonishing. for a maximum of 64GB cache. But that is not computational memory, it's just for caching. so the amount of data SQL Server can access for cache and computational memory, is thus much, much larger. It will pay off in almost all actions that SQL Server perfoms. Ofcourse, you need 64bit hardware to implement the 64 bit OS and 64 bit SQL Server editions. For larger and/or very active databases, you should always go for the 64 bit environment. True, this is all very trivial and obvious. Sorry for that. You surely know what indexes are, and why they need to exist, certainly for larger tables. Here are a few facts (just take them for granted), which will be explained later in more depth. For the "traditional" relational SQL Server tables, two types of indexes exist: clustered index and non-clustered index. A table without a "clustered" index, is called a "heap". Essentially, the table rows are then not ordered by some "key"
(this key is one or more columns of the table). Now, this table could have one or more "non-clustered indexes", but it's still a heap. the rows in the pages are sorted by that key. Thus, a table can only have ONE clustered index, because you can physically "sort"
the table rows in one way only (and not by another key at the same time: that's not possible). Preferrably, the key of the clustered index is a table column of a nummeric datatype, that increases with each row added. But, a character based dataype is often used too, like for example a "social security number". of a table (like a clustered index does). So, a table might have one clustered index (only one), and multple non-clustered indexes. tablepage which ofcourse contain all the data. That is one reason why an index speeds up searches in tables. where those pages point to the leaf level of pages. Those pages then, contains the actual keys and pointers to the table pages. When a query uses such an index, the tree is traversed, and the table row is then quicly found. unitl the sought after row is found. That's why, with larger tables, indexes are indispensible. A clustered index is somewhat "special" (if you happen to be familiar with Oracle, it looks like a IOT). What we have said in point 4, largely applies to a clustered index as well. Except that in this case, the leaf level are the table pages themselves (!). At the moment a clustered index on a table is created, the table rows get sorted (on the choosen key of the index). When that's done, the index leaf level, just is the same as the table pages. To put it in simple words: A clustered Index is the ordered table itself. Note: it's almost true, except for the rootlevel and any optional intermediate level. unique (clustered) index. You know probably that a Primary Key column in a table, must have all unique values. So, each row in the table is unique with respect to that particular column (or set of columns). will be created. In practice, you almost always will do that. But actually, a "unique" index is already sufficient. Don't worry now. There are just two index types (clustered and non-clustered). But an index can be defined as unique, if the choosen key, only takes on unique values. So, even a non-clustered index can be defined as unique. If a primary key is defined for a table, then you automatically have your (one and only) clustered index as well. one or more (a well balanced number) of non-clustered index(es). It's a bit of an art. You surely can have a situation where the addition of a non-clustered index helps tremendously. But if you have too many (useless) indexes, it works counter productive. indexes must be updated as well, to reflect the new situation. All objects in SQL Server have an "Object ID" (object_id). This holds for tables, indexes and other objects. Once indexes are defined on a table, those indexes have an "index id" (index_id or ind_id) as well. clustered index, just are the table pages. There are a quite a few dynamic management views and functions that show the properties of indexes and tables. Note: in some older views (from former versions) the "index_id" is listed as "indid". the number of pages, fragmentation level, if it might be a hotspot, or contrary, is not uses much etc.. etc..
=> If an index is a "hotspot", then that's good because it's evidently used much. But, if you have multiple "hotspots" in the same file, then you might consider moving an hotspot to another file. reorganize or even rebuild an index (maintenance of an index). => If an index is (almost) not used at all, you might want to remove it. and if they are fragmented, you can create lists of indexes on which you want to do maintenance. Besides, then you also know which rebuilds of which indexes will hit performance most during a rebuild. sysindexes (view): An old friend from former SQL server versions. It's still available in 2005/2008. to get the associated tablenames as well. and aggregates the number of leaf and non-leaf inserts, updates, deletes along with page latch statistics. 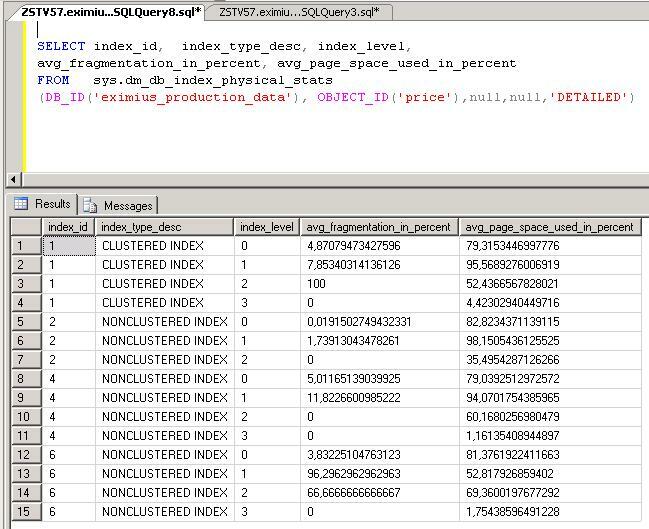 sys.dm_db_index_physical_stats (function): Shows per index the fragmentation and allocation information. as well as how many times it is accessed. be able to take advantage of, but that not exist within the database. So, they might be candidates to create. Let's take a look to a usefull query, using this "old" systemview. Let's try the following. It shows all tables with all their indexes, with their index_id's and number of rows. The list is sorted by the number of rows, listing the largest first. Note: In the actual real output, you will see the systemviews as well. Actually, it's a neat list. You can see all tables with their associated indexes. The indexes which are a clustered index, have an "indid" of "1", like "pkbob_price"
Remember that the (leafpages of) clustered indexes are actually the tablepages themselves. Also note that the table called "VALUE" is a "heap", with an indid of "0". It does not have a clustered index. and thats why you see the tablename repeated. It's also nice to have a list of the number of rows of the indexes. clustered indexes and non-clustered indexes. A function is not the same as a view, ofcourse. But, you use them not in a much different way as a view. In both case you make statements like "SELECT .. FROM [view|function ]. an "object_id", "index_id", or a "database_id" etc..
- If you specify all parameters, it usually means you need information of one object only. - In many cases, parameters may take on "NULL", which means you get information of more objects, or even all objects. Let's see how we can use the "sys.dm_db_index_operational_stats" function. and aggregates the number of leaf and non-leaf inserts, updates, deletes, along with page latch statistics. That's very interesting, because here you are able to extract information whether an index is much used or not. associated to the 'VALUE' table. - Ofcourse, you can extend the query with a clause like "ORDER BY leaf_insert_count" etc..
other columns of information can be extracted. In the above two example queries, we focused on leaf_insert_count, leaf_delete_count etc.. But this function will show you much information on "locks" and "contention" as well ! To find out if a certain index is "used much, or not", you can compare the "count" columns of the indexes. But there are many "wait" columns too, giving clues to if a certain index is a "hotspot". page_lock_wait_in_ms: Total number of milliseconds the Database Engine waited on a page lock. to move one or two to another filegroup. You should use this view complementary to the function in 4.2.2. The function from 4.2.2, shows you "waits" and leaf_insert_count, leaf_delete_count etc.. But with this view, will see differentation between user_scans, user_lookups, user_updates, last_user_seek,last_user_scan,last_user_lookup,last_user_update etc..
then obviously, the index is not used. It may even be a candidate to delete it. But not so fast. Maybe the "statistics" are so lousy, that the optimizer does not consider it. then consider deletion of that index. a "WHERE" clause that specifies your database (id) of interest. Also, the query might take so time to run in a very large database, so first experiment a bit on testsystems. Since its a view, use "SELECT * FROM sys.dm_db_index_usage_stats WHERE database_id=". "user_updates>n", or "ORDER BY user_updates" etc..
You really need to play with this view a bit, to appreciate the information you can get. how index pages are filled with rows, and what their average fragmentation level is. Make sure you have scripted your objects, that is, have the create scripts of all objects. you can do it "ONLINE", but, for example, you don't want to move a 700 million row index while the users are busy. Personally, I think that moving objects like tables and indexes to other tablespaces, is quite easy in Oracle. 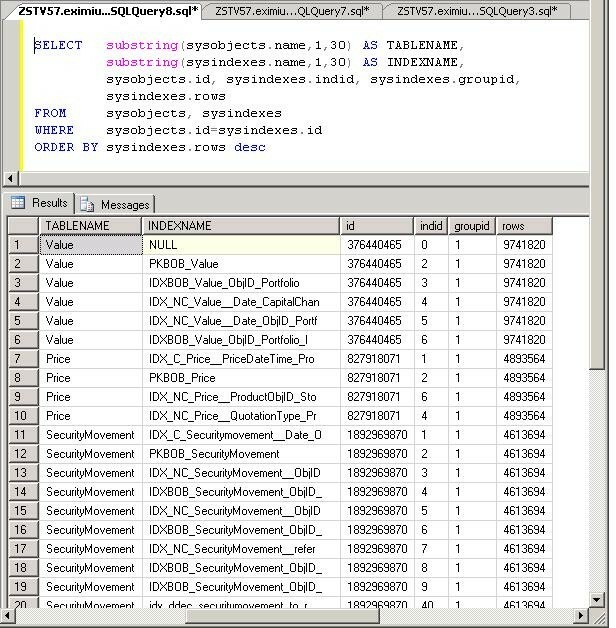 Ofcouse, the methods exist in SQL Server too, but here it's somewhat more elaborate. Anyway, if you move an index from one filegroup to another filegroup, there might be a mean rattlesnake in the grass. Essentially, moving an existing index, means dropping it and then recreating it. Now, if this index supports some Constraint, like a Primary key, or PK-FK relations, you must enable them again! by the Database Engine. But, other statements (like ALTER INDEX) will work. all create statements with respect to tables, indexes, constraints, triggers, etc.. etc..
for example, an index create statement etc.. without that you need to "remember" which columns were involved. It's easy to do that: just browse around a bit in SQL Server Management Studio (SSMS). Note: Many professional systems, have some sort of repository, describing all objects, including the TSQL create statements. Now, how to move an table and or an index to another filegroup? Let's review in a few simple examples, how indexes are created on an existing table. Note that I did not use the "ON FG_INDEX" clause with the clustered index create statement. I could have done that, but that would imply that I "moved" the table to that filegroup. Again, the table (in simple words) is actually the same as the clustered index. DROP the clustered index. Create the Clustered Index again with Filegroup clause pointing to the right filegroup. Ofcourse, it's the same as above. You cannot move indexes supporting a unique or primary key constraint, using a DROP statement. As we will see later on, to move these indexes, we must use the CREATE INDEX statement with the (DROP_EXISTING=ON) option. DROP the non-clustered index. Create the non-Clustered Index again with Filegroup clause pointing to the right filegroup. The points 2 and 3 are great, if you would have the original CREATE statements of those indexes. the index is dropped and re-created, and will preserve the existing constraint. In section 4.2.3, we have touched the "sys.dm_db_index_usage_stats" Dynamic Management View. on the usage, or the effectivity, of an index. that the index is used much. So, it's probaby an effective index. So, if the "total Reads" > "total Writes", it's a good index. that the index is NOT used much. So, it's probably an ineffective index. If there are little reads, but many writes, the system is busy updating the index, without that users are using it. You know that writes to an index means updating it. Reading an index means that a query is using it. So, if the "total Writes" > "total Reads", the index only spills performance, and it's not a good index. Here is a handy query that produces a list of the indexes in a Database, including the Reads from, and writes to, the indexes. Note how this query only uses the "sys.dm_db_index_usage_stats" Dynamic Management View. if an index is too much fragmented or not. The function need a number of parameters, which might be left as "null". The more parameters you specify (as not being "null"), the more specific the output will be. (1) Get the details (a list) of the fragmentation levels of all indexes in a certain Database. (2) Get the details of the fragmentation levels of all indexes of just one specific Table. (3) Get the details of the fragmentation level of just one specific index of just one specific Table. The first query, shows the fragmentation (column "avg_fragmentation_in_percent") of the indexes of the EMPLOYEE table only. The second query, shows fragmentation information of all indexes (of all Tables) that exist in the SALES database. Note that the column "avg_fragmentation_in_percent" in the output, shows you the relevant information. In section 4.2.4, you can find a real example, with example output, of using this function. According to Microsoft documents, you should Rebuild indexes when the average fragmentation is higher than, say, 25 to 30%. You might consider Reorganizing indexes when the average fragmentation is between, say, 15 to 25%. For the smaller indexes, don't expect high improvements from rebuilding or reorganizing indexes. For larger indexes, the improvement can be very significant. - Reorganizing, defragments only the leaf level of clustered and nonclustered indexes on tables. The same pages are used again. Since a fill factor can be specified, it's likely that empty pages will result by this "compaction". These are removed, and thus providing additional available disk space. The fill factor, as the name already implies, specifies "how full" a page should be filled, like for example "70" (70%) or "80" (80%). all levels (leaf level, intermediate levels, root level) are recreated again, and all fragmentation is removed. In this process, you reclaim disk space, since all pages are build again using the specified "fill factor" setting. Usually, rebuilding an index is more resource intensive than reorganizing an index. Reorganizing is automatically done "online", thus while sessions may access the table and index. Rebuilding can be done online or offline. If done offline, locks will block sessions for the time the index is rebuild. With the Enterprise Edition, using the "ONLINE=ON" clause, you can rebuild indexes online. Still, with very large indexes, it's really best to rebuild them during the times of least activity in the Database. First a warning. You can explicitly DROP an index, and CREATE it again, assuming you had the original CREATE statement. In most cases, the Database will not execute the statement if the index supports (or "is") a Primary Key or Unique constraint. But you still must be carefull, in how far the index supports any constraint at all. You have to investigate that first. So, it's best to NOT to "DROP" and "CREATE" an index, unless you know the details of your constraints. But, when using the "ALTER INDEX .. REBUILD" and "DBCC DBREINDEX()" commands, you are pretty save. Thus, you can use two types of commands to Rebuild an Index: the "ALTER INDEX" statement and the "DBCC DBREINDEX()" statement. The DBCC command is more SQL Server 7/2000 "style", but it's still valid in 2005 and 2008. Just take a look at the following examples. How to deal with all indexes of all tables in a database, is the subject of the next section. that you can use with the ALTER INDEX and DBCC REINDEX commands. ALTER INDEX IDX_Employee_EMPID ON Employee REBUILD -- only rebuild the index "IDX_Employee_EMPID"
So, "ALTER INDEX ALL Table_Name REBUILD WITH (FILLFACTOR = n)" takes care of all indexes of a certain table. So, "DBCC DBREINDEX(Table_Name,'',Fillfactor)", takes care of all indexes of a certain table. Maybe this is a difficult question. It's certainly a very interresting question. If needed, search Books Online (BOL) and/or the Internet for answers. Suppose a table has a clustered index, and several non-clustered indexes. What happens to the non-clustered indexes, if you rebuild the clustered index? we can use a looping construct, called a cursor. Chapter 5. How to determine if you have too low CPU power. Again, just like in chapter 1, System Monitor (or Performance Monitor), and the dynamic management views (dmv's) can learn us a lot. because of waits of some sort. Let's first take a look at what we can discover using Performance Monitor (perfmon). This is going to be a bit of a trivial section, I am afraid. Some obvious counters are "Processor\%Priviledge Time(_Total)", "Processor\%User Time(_Total)", and "Processor\%Idle Time(_Total)". the "System\Processor Queue Length" counter. Please see section 1.2 for a short explanation on "objects", "counters", and "instances". There are ofcourse many other interresting counters like "%DPC Time" etc.., but these are not that "relevant" for "our quick look". - %Idle Time: Shows the %time that the processor(s) was idle during the sample interval. - %Priviledge Time: Shows the %time that the processor(s) was running Kernel Mode code during the sample interval. - %User Time: Shows the %time that the processor(s) was running User Mode code (non kernel) during the sample interval. - %Processor Time: Is almost the same as (%Priviledge Time + %User Time). if on average it's much more than 2 x #cpu's in your system. on average, or for a considerable amount of time (say, during a "batch"), you might have a cpu botlleneck. you do not have a CPU pressure on your system. 2. If on average, you system shows about 40, 50, 60 %Processor time, I would say it's nicely at work. Because, suppose that the cpu's were idle all the time, then that's not good either. It would be a waste of cpu power. 3. Now, what if the cpu's show a %Processor time which hovers around 90% most of the time? That should certainly get our attention. also caused by "some deeper technical reason"? then you have a strong indication of a structural CPU pressure. Although it all seems "obvious", do no jump to conclusions yet. I think that after reading the material in chapter 9, we will appreciate that statement somewhat more. high values on average, it's quite likely you have a bottleneck "somewhere". And indeed, it's likely to be the cpu's. But what to think of this example. Suppose you have a Database Server, and a number of application Servers. Database Server at the same time, and all keeps running until the batch finishes. Maybe thats why we see such a high cpu pressure. It could be true that this is "as designed", and we are too low on cpu power. Or something else is not right. We always need a helicopter view so to speak, on the system as a whole. So, it's often too difficult to reach well founded conclusions, using Performance Monitor alone. That's why you also need other information, and at least take a look at the dynamic management views as well. Again, the DMV "sys.dm_os_wait_stats" can give us valuable pointers to existence of possible "CPU pressure". the cpu cannot keep up sufficiently with the demands. it will be put in a "waiters queue", until conditions have arived that makes it runnable again (put in the runnable queue). The time waiting in the runnable queue for CPU, is shown as "Signal Waits". The time waiting for a resource is shown as "Resource Waits". and thus allows us to compare the two. If the total of "%signal waits" is highest, it's a reasonable pointer to suspect CPU pressure. If the total of "%Resource waits is highest, it's a reasonable pointer to suspect overall poor IO, or excessive locking behaviour. Again, to draw conclusions on this alone, is not a good idea ! Also take a look at section 5.1.
and then return to this section. So please continue with the other chapters. Thanks ! the design/implementation of storage for your database is very important. diskvolumes (actually, different independent spindels). I presume that the upper is know to you. In chapter 7, we are going to deal with that subject. In this chapter however, we mean something different: here we are going to spend a few words on the "allocation unit"
and "partition alignment". This subject is not too exiting, and don't expect miracles from it. maybe does not apply at all! That's why you need to talk with people who understand your type of storage. is determined when you format the disk. Here, you often can choose values like 2K, 4K, 16K, 32K, 64K, and sometimes even larger. Now, the question may arise: is there an optimal allocation unit for SQL Server? The fundamental pagesize in SQL server is 8K. Secondly, SQL Server often 'read ahead' in 64K 'chunks' (extends). This question relates to the RAID implementation you have choosen, like RAID5 or RAID10. should take as a suitable allocation unit. use a "n x 64K" stripe size (like 64K, 128K, 256K). 2. After the RAIDn unit is available and viewable as "a disk" in Windows, you partition and format it. Now, what allocation unit should you choose? This is very a hard question to answer. Microsoft articles seem to suggest that it's always best to choose an 64K allocation unit. That might be true. Surely, SQL server is their product, so they should know. with 4K, 8K and 64K allocation units. The results varies a lot, so IMHO, we cannot easily answer the question! It all depends on storage, type of RAID, stripeset choosen, type of database etc..
very neat rebuild tables/indexes, I would also choose 64K allocation unit. So? I am afraid I was not able to fully answer the question of the "best allocation unit". Hopefully you agree that's simply not easy to answer unless you know a lot of details. for table and index data 'thinks' in 64K chunks (extents) anyway. Many articles which discuss "partition alignment", speak of a possible "overall" performance increase of about 15%-30%. So, if you do this "right", it could have a significant effect. This work is or should typically be done by a storage admin, or sysadmin, who installs a Server and implements the disksubsystem. Maybe first you should check with those people, to get the facts (for your specific storage) straight. In the unlikely case they answer with "huh..? ", then you have to provide the neccessary input. Partition alignment, (or volume alignment, or sector alignment as it is called occasionally) has "something to do"
that is in effect on your RAID system. If this not the case, more IO is done than is strictly neccessary. Now, the point is, the Vendor of your diskarry, or the person who installs it, should know these "magic" numbers. In practice however, if the information is not available, there are generic setups that seem to work. If you setup partitions under Win2K8, you will not be "bothered" by the misaligned offset. This system will take care of it. But, on Win2K3, it could be an issue. Anyway, if on Win2K3, a 64K offset (128 sectors) is a common value that works on many storage arrays. Win2K8 uses a 1024K offset, which should work even better. So, we will take that as our preffered offset. How to do it yourself? The tools you could use are "diskpar" or "diskpart". However, DiskPart.exe is the preferred method since it's newer and is included as of Win2K3 sp1. DISKPART> format fs=ntfs unit=64K label="SQLINDEX"
Note that in the above example, I choose for align=1024, which is 1MB or 2048 sectors. It's very likely that this boundary will match most stripe units. There are so many more considerations on storage. For example, a feature like "HBA queue length" is important as well. So, in general, I would say that DBA's just need storage specialists for large projects. "some" role as well in "overall" performance. If you are not too familiar with the concept of "filegroups", here is a small demo. only the PRIMARY filegroup (the default), we make two additional "logical containers": SALESDATA01 and SALESINDEX01. A filegroup can contain one or more files (usually more than one, if we have a large database). than the files of the other filegroups. If those filesystems correspond to really different diskvolumes, we can achieve parallel IO. filegroup it is supposed to live. Or, with existing tables and indexes, it's possible to move tables, and non-clustererd indexes, to their own filegroups. seperate large tables (or indexes) on their own filegroups (just create the appropriate number of filegroups). In the above example, you see that I only have F:, G:, and H: for filegroups for tables and indexes. It's very important to put the "transactionlog file(s)" seperate from the above filesystems for tables and indexes. Create nonclustered indexes on a filegroup other than the filegroup of the table (= clustered index). And repeat that approach for all other relevant large and/or active tables. of indexes on "filegroupA", and possibly another fairly large number of indexes on "filegroupB". This is all actually no more than "common sense". and/or active tables are present. Suppose you have found tables A,B,C,D,E,F,G,H to be very large. Now, nothing prevents you from placing Tables A, B, C, D on filegroup "FG_ABCD", and place the tables E, F, G, H on filegroup "FG_EFGH". As a small bonus, having the non-clustered indexes on their seperate filegroup(s), you have some level of additional protection. If the drive(s) containing those filegroup(s) go bad, or something else crashes, you can regenerated the non-clustered indexes again. Note: always have a recent database script with create statements of all tables, indexes and all other objects ! among a number of filegroups on different diskdrives. That's not a bad idea either. It's evident, that here, you are most sure that all diskdrives are used at all times. on several filegroups (which themselves should reside on different "spindels"). Here is some extremely short, and lightweight, information on table and index partitioning. In this section, we go one step further, by "partitioning" subsets of the same one table, on their own filegroups. that particular column would have values that are easily divided into subsets, like for example "years". to the years "2000", "2001, "2002" etc.. Creating a partitioned Table, or Index, is a 3 step process. fall into, and make sure that you can store those different record subsets (the different Ranges), onto separate Filegroups. - We start by defining a Partition Function. This is function that defines the boundaries, or Partition Ranges, that the subsets of rows will use. - Thirdly, we create a Table, using the definitions above. So, a simple example will illustrate this. 1. Suppose we have a certain database, which uses the filegroups FG1, FG2, FG3 and FG4. Suppose we have a table PARTSAMPLE that we want to partition. It uses the columns ID (datatype INT) and NAME (varchar(20)). The values that ID can take, are for example 1…1000… 7000… 20000… 30000 etc..
We do that by creating a Partition Function, whereas later we are going to "bind" it somehow to the table. This function, is an independent object in the database. Later we will use it in the PARTSAMPLE table definition. relating the FileGroups to the Ranges (or boundaries). 4. As the last step, we will define our PARTSAMPLE table, using the Partition Scheme defined above. So, if a record with an ID of 15000 would be inserted, it would be stored on FileGroup "FG2". Likewise, if a record with an ID of 25000 would be inserted, it would be stored on FileGroup "FG3". Chapter 8. Other remarks on several subjects. In this chapter, we will review a couple of other important subjects. 8.1 The right choice of datatypes. and the datatypes (and possibly other attributes as well). For example, we have the datatypes "int" (integer), "decimal(n,m)", "char(n)", "varchar(n)", "datetime" etc..
fits in a table page. This cost performance, because the database needs to read more pages, to get the same imformation. a datatype of "char(2000)", meaning a fixed column lenght of 2000 bytes. Now if the comment is at most just a few words, then that's a true waste. So, always try to choose a datatype (with a "width") that suits the purpose, but also not "that thight". Just try to balance it a bit. The choice a datatypes also infuences the amount of "processor time". If you think about a very active database, the first thing that comes to mind, is heavy Disk IO. But certainly not in all cases. High cpu utilization is a very important performance issue too. Now, dont think that this will only happen at the physics department, where difficult calculations are used. are the best. Just depends on the application. Hopefully, the developers are aware of this fact. Not all are, so I have noticed. 8.2 Some remarks on TEMPDB. used for all kinds of sorts, or as a sort of intermediate storage containers, during processing. A bottleneck in tempdb IO, can impact the overall throughput of your SQL Server. How active TEMPDB will be, depends on SQL Server itself, and the application. then usage on TEMPDB can be very high. to make a judgement on how active TEMPD actually is. You can also write your own system queries that gives info on the activity on TEMPDB. on a fast disk which was not much used before. disk, which might only be used "occasionally" (once a day, or once an hour, for full- or transaction backups). Ofcourse, in some cases, that's not a good idea. Only you can determine how matters are in your situation. A recommendation you can find in many articles, is to let TEMPDB consist of several datafiles. Some even recommend, that you let the number of files to be equal to the number of cpu cores. 8.3 Carefully consider the Max memory limit for SQL Server 64bit. Suppose you use SQL Server 2005/2008 64. What should be the maximum memory you should assign to SQL Server? Actually, this looks easy, but it isn't. (like backup software, anti-virus, monitoring agents etc..) needs memory too, which can be considerable. Because... you don't want that the system exhibits excessive paging. There is no good alternative other than to discuss this with your nearest senior sysadmin. So, in the upper example of a system of only 16GB, I suggest you limit it to 12GB. Just a few words on NT paging. Using Performance Monitor counters to "measure" the amount of paging, can sometimes be a bit confusing. or pages from and to cache. Some applications or tools might "page" to memory mapped files, which will "distort" the view considerably. Besides that, many causes exist why "Memory: Pages/sec" produce high values. But anyway, it should not be too high ofcourse. "Memory: Pages/sec" - moderate to high. "Memory: Available Bytes" - would be low. "Paging File: % Usage" - would be high. "Paging File: % Peak Usage" - would be high. "Memory: Pages Output/Sec" - would be high. and is therefore a good indicator. It's true that NT will always page to a certain extent. Especially, with all monitoring "tools" loaded, NT systems will certainly page somewhat. As to the size of the pagefile, as a rule of thumb for "low" memory systems, it should be around 1.5xTotal RAM. Ofcourse, the more memory you have, the less important the size of the pagefile is. No sysadmin will ever create a pagefile of 128GB, if the system has 64GB RAM. 8.4 Commit limits and remote logging of Batches. What I have seen occasionally, are two sort of "misconfigurations" that can affect performance in a negative way. Most applications, will have some sort of batch facility, which is likely to be scheduled after working hours. The architecture of such batches, is very diverse. What can be worthwile, is to investigate if some "component" does "logging" (to a logfile) at a remote host. If in such a case, a sort of "SEND - Acknowledge" scheme is in use, that can slow down the batch significantly. some sort of "commit limit". What I mean is this. Such an application generates smaller or larger batches of transactions. Each of these batches is comitted. But what is the lenght? Is such a batch 1, 10, 1000, 10000 records "wide"? In the extreme, if a "batch" is only 1 "wide", that too can slow down the batch significantly. Chapter 9. Some real world cases, describing somewhat more complex performance problems. In this note, we have seen a few subjects that might be the origin for performance problems. As said right from the start of this note, we do not cover Query Design. Actually, this is one of the most common causes of low performance. Indeed, the impact can be quite severe. lots of cpu power etc.. etc.. Still you might encounter what appears to be "performance issues". CXPACKET: Probably related to "Parallelism". SOS_SCHEDULER_YIELD: Might be an indicator of CPU pressure. ASYNC_NETWORK_IO: Might be an indicator of poor Network I/O. LCK_X, LCK_M_U, & LCK_M_X: Long lasting locks, and/or locks that involve many extents (leading to blocking). PAGEIOLATCH_X: Buffer I/O latch, maybe due to poor Disk IO, or low on memory. ASYNC_IO_COMPLETION & IO_COMPLETION: Could also be attributed to poor Disk IO, or general IO issues. WRITELOG & LOGBUFFER: Might be due to poor IO to the Tranaction log disk subsystem. In the next sections we will some examples of these wait_types. that their frontend applications often "stalls". a lot of tracing or logging "material", which you can "see" using the "dynamic mamagement views (DMV's)". Although you may not call it "tracing material", the DMV's sure functions that way. The "keywords" in the title of this section, look pretty impressive. Actually, these are "wait_types". 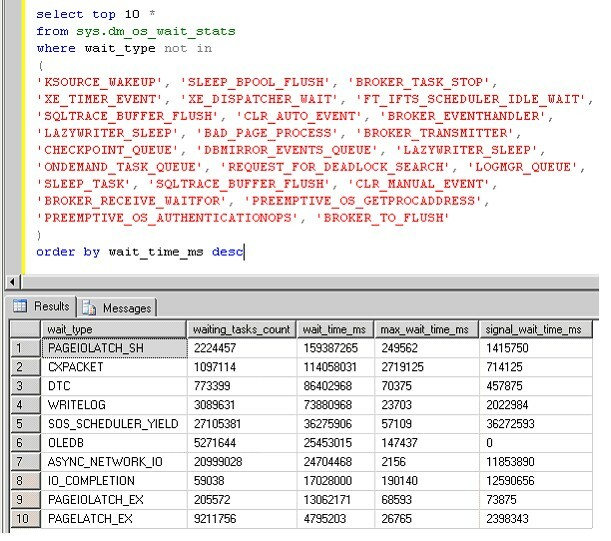 If you switch back quicly to section 1.3, you find a nice query giving you a top 10 "wait times"
and telling you what "wait types" they are associated with. Note from the figure in section 1.3, that the "waittimes" due to "wait_type=CXPACKET" are pretty high too. The wait_types CXPACKET, SOS_SCHEDULER_YIELD, LCK_M_U are in many cases, related to each other. because not all operations have completed. This results in waiting defined as CXPacket. The setting that determines if "parallelism" is "switched on", is "Maximum Degree of Parallelism" or MAXDOP. If you rightclick the server object in SQL Server Management Studio, you can view and modify all sorts of settings. In the "Advanced" page, you will find the "Maximum Degree of Parallelism" setting. If you put it to "1"
you have it switched "off", although TSQL statements can override it with the MAXDOP clause. Ofcourse, different sessions all operate, and stay to operate, in "parallel", but the parallelism of one statement is off. If the MAXDOP setting was, for example, "8", you might lower the value, and see what the result is. Lck_M_X is associated to exclusive locks, which too might cause other processes to wait. do at that time, because another process already has aquired a lock of some kind. A possible cause to high values of CXPACKET and LCK_M_U might be threads of an application that are frequently waiting on each other. In this case, it might be due to ineffective "application design". In this case too, it might be due to ineffective "application design". Knowing the internals of MSDTC and distributed transactions and application design, is a complex world of it's own. to use parallelism. It might thus help to reduce the MAXDOP setting, as explained above. But, with some particular queries, they might use parallelism that might give rise to LCK_M* and CXPACKET waittimes. That's it. Hope it was of any help.